Baoli Fork Lift Trucks is one of the largest manufacturers of fork lift trucks in the world and parent company KION is famous for brands such as Linde, Still and OM. 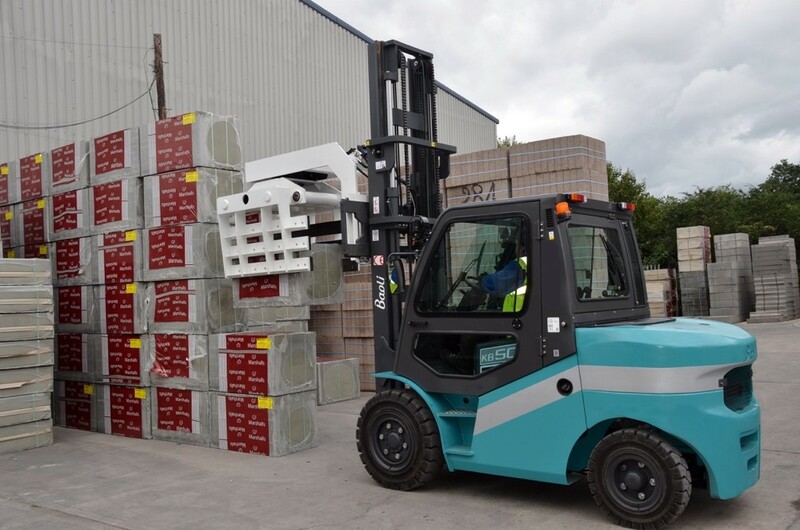 Longhe UK were approached by their customer, Neckar Forklifts, who are Kion Baoli UK dealership, to replace a fleet of block clamps currently in use by one of their key builder’s merchant customers. The challenge was a double one – not only to design a new attachment for the Longhe range, but also to coincide the delivery with a new Baoli lift truck, also coming from China, which would take the attachment, and be supplied to the end user. When Baoli UK were asked by their customer to quote for replacements to their Block Clamp fleet, they approached Longhe UK for a solution. The existing block clamps were old models, and none of the three units could pick up all the variations of product which needed to be handled with safety and precision. 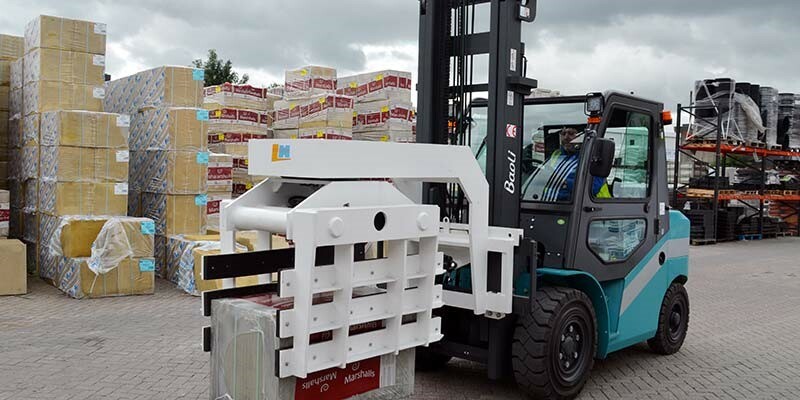 The main requirement of the new block clamp was to lift a range of brick, concrete block, roofing tiles, paving slabs, kerb stones, and concrete drainage products, at a busy builders’ merchant site. The attachment was required to provide three additional hydraulic functions to the basic fork truck lift and tilt operation. It had to clamp, rotate 360° continuously, and side-shift. Working closely with Baoli and the supplier, Longhe created a bespoke design, as the requirements were very specific. The whole process had to fit with the customer’s tight schedule, and delivery of the new Baoli truck. The fork lift truck block clamp attachment was specified and site-surveyed by a representative from the Longhe UK team, with the support of Neckar Forklifts and the end user. Draft designs were created by technical specialists at Longhe China HQ. There were several issues to resolve during the process, such as hydraulic connection, additional hydraulic services for the attachment and block clamp pad specification. Once the drawings were approved the block clamp was manufactured within six-weeks at China HQ factory. The newly manufactured block clamp was assessed on a truck at Longhe for week, to hot-test the product, and make minor adjustments to the hydraulic function speed. The product was then hot-tested at China HQ factory. Attachment arrived at UK port and delivered to the customer. The experience and product knowledge of the Longhe team, coupled with the close support and expertise of Neckar Forklifts, enabled the installation of an attachment that fulfilled the requirements of a very high demand operation. Longhe UK look forward to supporting Baoli for the next clamp replacements from 2018 going forward.